The Altar Guild is entrusted with the privilege of preparing the chancel and its furnishings for worship—both to glorify God and to provide a setting which enables the congregation to worship in a meaningful way. 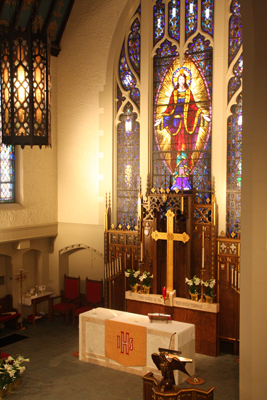 St. John’s Altar Guild has served the church since 1978. Communion – each week the vessels must be filled with bread and wine and placed on the altar in preparation for upcoming services. Housekeeping – the chancel and its furnishings (altar, pulpit and lectern) are kept clean and linens are changed, cleaned and pressed in readiness for worship. Paraments – paraments adorn the furnishing of the chancel in colors of the liturgical day or season and with symbols reminding worshipers of various aspects of the Christian faith. Vestments - acolyte vestments in the appropriate liturgical color or season must be ready and in good repair for use in services. Preparations – in addition to weekly services, Altar Guild is also responsible for preparations for Holy Baptism, weddings and funerals.